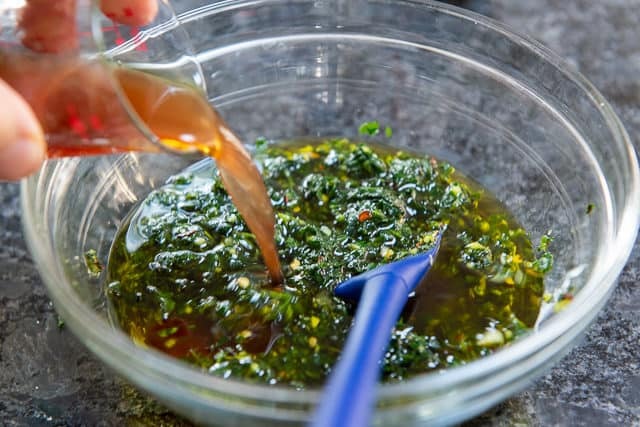 Chimichurri - How to make Chimichurri Sauce in 5 Minutes! 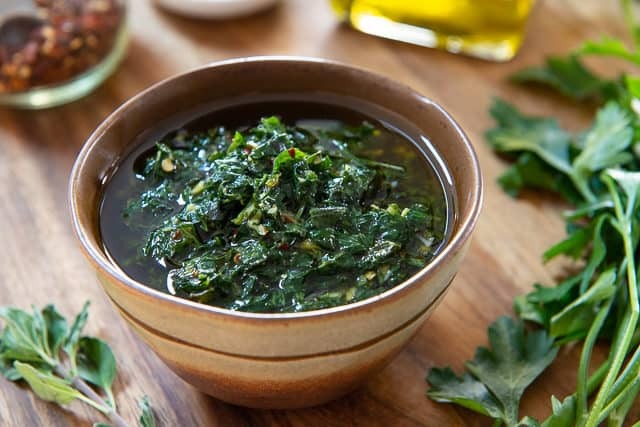 Chimichurri is a simple Argentinian sauce with fresh, bold flavor, that pairs particularly well with meats like beef and chicken. It takes less than 10 minutes to make! 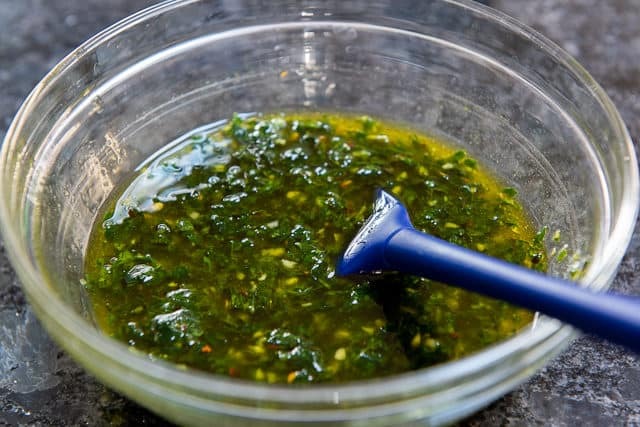 If you’re a fan of bold flavors, Chimichurri sauce is one of the best foods out there. I fell in love with it in my early 20s after trying it at a restaurant, and it has been a favorite of mine to make on steak night. I’ll eat it with any sort of seared steak or grilled piece of beef, but it is especially traditional with cuts like skirt or flank. What really make chimichurri shine in my eyes is the fresh oregano leaves. I so rarely see fresh oregano used in cooking outside of Greek dishes, and it really makes the flavor of the chimichurri unique. Make sure not to substitute dried oregano! If you’re wondering why we mix this part in a bowl instead of in the food processor, it’s to keep the chimichurri from getting cloudy. But it’s purely aesthetic, so if you find it easier, you can pulse in the food processor. 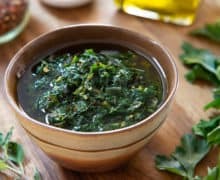 I like my chimichurri a bit heavy on the olive oil so it’s more of a dressing than something with a thick pesto-like consistency, but I have a range that I specify in the recipe, so you can make it to your liking. You can always add more olive oil as needed, to suit your preference. Once the chimichurri is done, keep it in the fridge until you’re ready to serve. I recommend pairing it with steak or even a whole roasted Spatchcock Chicken. Enjoy! Can you make Chimichurri ahead of time? It’s best made at least a few hours ahead, to allow the flavors to meld. Feel free to make it a day or two ahead. 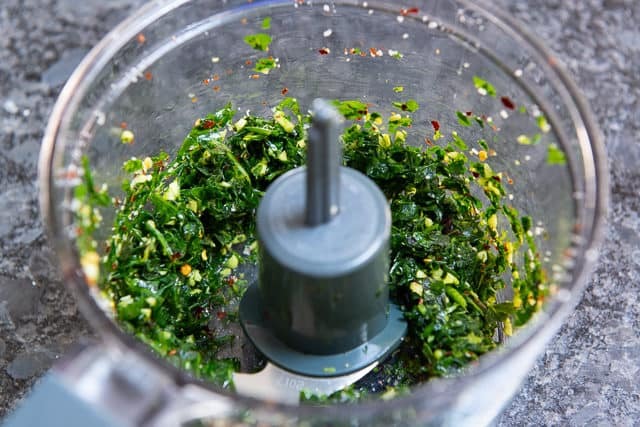 How long does Chimichurri keep? Up to 2 weeks in the refrigerator. Can you freeze chimichurri? I don’t recommend it. The herbs will go dark and not have as nice of a flavor. 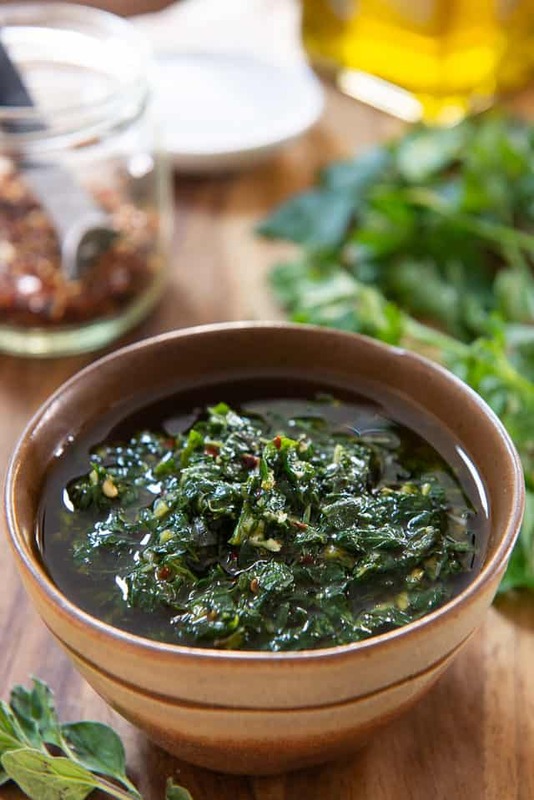 Chimichurri is a simple Argentinian sauce with fresh, bold flavor, that pairs particularly well with meats like beef and chicken. 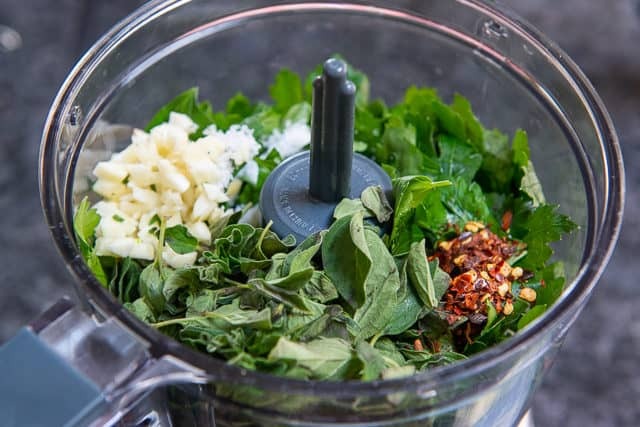 Combine the parsley, oregano, garlic, salt, and red pepper flakes in a small food processor, and pulse several times until well-chopped, but not pureed. Transfer the chopped herbs to a bowl, and whisk in the olive oil and red wine vinegar. Taste for seasoning and add more salt if needed. 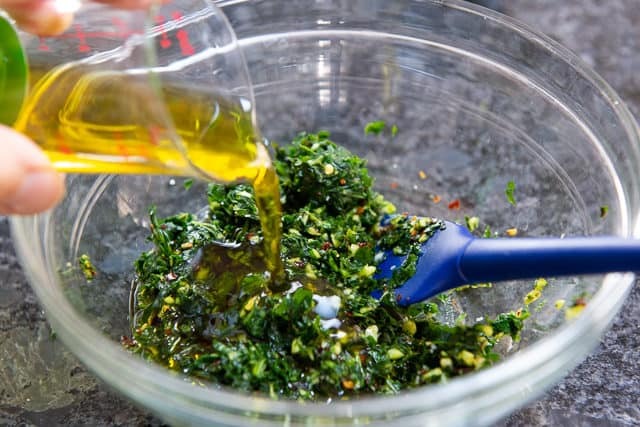 Ideally, let the chimichurri rest in the fridge for at least a few hours before serving, to allow the flavors to meld. Then serve and enjoy! *I prefer a looser chimichurri sauce, with generous amounts of olive oil and red wine vinegar. If you want something thicker, start with less and add more if needed. Just keep a 2:1 ratio of olive oil to red wine vinegar. For example: Start with 1/4 cup olive oil and 2 tbsp red wine vinegar, then see if you'd like more.